On the 16th of July I organized time on a longarm quilting machine for the 14th + 15th of December 2015. By that time I had about finished the blocks for the second and third border but not yet attached even one of those. Psst! Don’t mention the border 4 to 6. But that was 151 days ahead of time. Almost half a year. I should be able to finish the quilt easily till then, right? Let me tell you a bit about what booking longarm time 151 days ahead means in my world – well, and show you the quilting pictures of course. My No. 1 reason why I should have been able to finish it in time? Besides the obvious half year? Well, a whole week of vacation days in November. I can easily finish it in that week, right? This is what happened: I didn’t work on it. Not again until September. It’s not that I didn’t sew… I just preferred to work on other stuff although this was the only one with a deadline. But the voice on my shoulder told me: That deadline is far, far away. I guess that is the time when my new sewing friend Allison @ Campell Soup Diary started to get nervous. I on the other hand was still quite relaxed. Early November I started on the logcabin blocks. Then the vacation days came and with it a lot of other stuff I wanted or had to do as well. I sewed a bit and on the Friday we had a blast at our „Patchwork Treffen“. I started on the butterflies for the last border. I actually finished about half of them. By the way this is a great idea to help with that. If I had kept sewing regularly for a bit every other day… Well, you probably guessed that didn’t happen. In the end I started finishing the quilt top on the Wednesday before. I stumbled upon an problem – the tops size was way off. But my top was just three borders big. The rest was only single blocks. I was panicking my then. And maybe annoyed with myself. I knew I had to get it fixed but how… my head was spinning. A calming & encouraging phone call later and with the aid of talking notes, I made it work by adding a bigger sashing between the third and fourth border. With working full time and only sewing „a bit“ on Thursday, I knew Friday would be a late night. Night? I was so far away from finishing the top that I talked myself into believing that driving later – not after breakfast but maybe midday – was not that bad. After all check-in time at the hotel was till ten o’clock. So I called it a day around midnight and sleept for some more or less restful hours. Starting again early in the morning to get it finished – in two or three hours. Do you want to guess the time I was finished? I finished the quilt top five in the afternoon! I still hadn’t packed or eaten. Both rather overrated when having a sewing meltdown. I packed my stuff in five (!) minutes, grabbed the car keys and off I went. The trip went smooth, the quilt shop owner and employes of Quiltzauberei were very kind and the sewing went almost bump free. And the missing stuff? Well, I bought replacements at a rest stop along the way. Yeahh, „finished“. For the second time working on a longarm ever I am really proud of my results and more than happy. I didn’t tie-off the threads by machine so I will have to bury them oneday… So far I have not been able to motivate myself. Hate that job! And it feels like I have a million to get to. Do you knot the threads by hand (to bury) afterwards or do you secure them by machine and cut them? And are you as „last minute“ as I am or more „on the safe side“? Oh my goodness. This quilt is GORGEOUS!!! I’m very impressed. I also wait until the last minute to get projects with a deadline done. It such an annoying characteristic of myself but I do it again and again. When I should be working on things with deadlines I’m working on fun, new projects! Lol. Oh, wow, your quilt is just gorgeous!! I love the bright solids against the gray. I can completely commiserate with your time crisis, too — I tend to struggle with far off deadlines, waiting until two or three days before a project is due to really get started working on it. Definitely end up with some panic and chaos! What a beautiful quilt top! Love, love, love your colour choices! The result is stunning! We quilters always need a little excitement along the way in every project, don’t you think? This is SO lovely! The quilting looks great! Super pretty, I just love the bright colors and how the gray just makes it all pop. thank you for showing your quilting process, I found that super interesting. Well, despite the fact that I pushed you so hard on this, believe it or not, I actually am a last minute kind of gal. (why do you think I push myself to get the bee blocks done asap?… so I don’t run into these kind of hiccups) But on the other hand, I much prefer to be there hours before the plane leaves than to show up just as they are boarding! Can’t wait to see this… it looks awesome!!! I love the pattern and all the bright colours. Fantastic quilt! 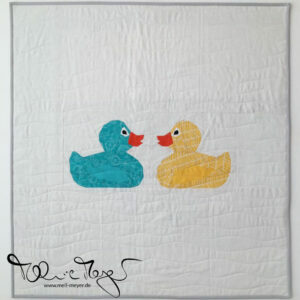 Amazing quilting, especially given that you don’t use a long arm regularly… love, love, love it! And those bright solids. Awesome! Beautiful! All those colours! Are they Kona? Good on you for hanging in there and getting the job done…virtue is rewarded!! Your color blocks against that grey is very beautiful. Sometimes deadlines are great, sometimes they stink. But your quilt is beautiful, aren’t you glad you finished it? Love the quilting, too. Wow, what a gorgeous quilt and your quilting really makes it. I tend to bury the threads, I’m paranoid that not burying them means that the quilting will come out. 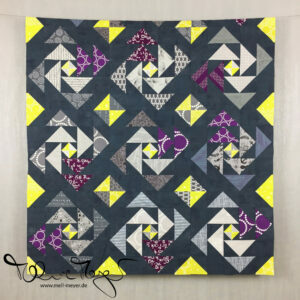 Your quilt is absolutely gorgeous, love those solids! Well done on your longarm quilting, it looks stunning. I do try to knot and bury my ends by hands these days, its looks much neater, stick a favourite film on and settle down with a needle, you’ll have them done in no time! 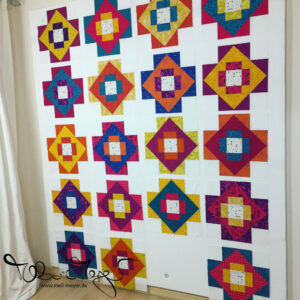 What a fabulous post and such a beautiful quilt, Melanie! You had me on the edge of my seat. Your quilting turned out fabulous! Yes. Those are a lot of thread tails to bury. I knot my threads and bury them by hand, too. But don’t do this very often. I really am a fan of edge to edge quilting, so I can avoid that job!